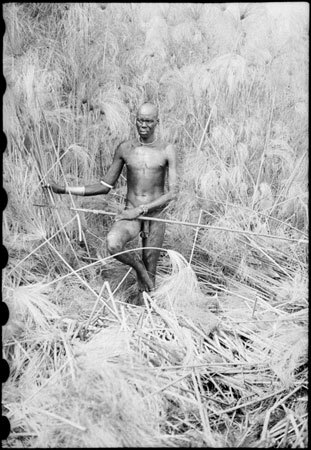 A portrait of a Nuer youth wearing thiau armrings on his right arm standing with his spear among papyrus plants on the bank of a lagoon. The context of the image is a hippo hunt that men and youths were involved with on the Nile. Morton, Chris. "Nuer man in papyrus" Southern Sudan Project (in development). 03 Jan. 2006. Pitt Rivers Museum. <http://southernsudan.prm.ox.ac.uk/details/2004.130.32851.1/>.